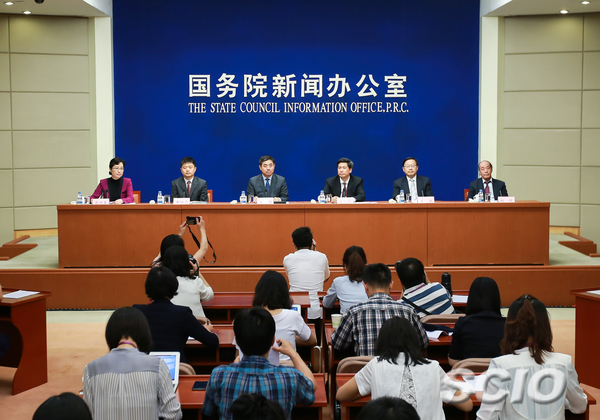 The results were disclosed at a news conference on Monday at the State Council Information Office of China. Previously, some overseas scholars expressed doubts about the length of Chinese civilization due "to a lack of physical evidence." For example, at the Liangzhu Site in Hangzhou, Zhejiang province, which dates from 5,300 to 4,500 years ago, archaeologists unearthed a huge dam 3.5 kilometers long and more than 10 meters thick. Ruins of the city cover 3 million square meters, and the city's walls are 40 to 60 meters thick. The discovery was made possible with remote sensing technology. "In the city center, we found a terrace that is 630 meters by 450 meters," he said. "Some of the foundations are as large as 900 square meters." "It hardly would have been possible for a tribe or a league of tribes to mobilize so many people," Wang said. "That indicated a time of early-stage states with wide influence." Division of labor, hierarchical social classes and inequality in wealth were also observed when studying the Taosi Site (from 4,300 to 4,100 years ago) in Xiangfen county, Shanxi province, and several other key sites of "huge city ruins," he said. "Around 5,000 years ago, some regions along the Yangtze River, the Yellow River and the western bank of Liaohe River (in Northeast China) stepped into the age of civilization," Wang said. Those ancient states, he said, "controlled certain territory, but had economic, political and cultural connections with each other." 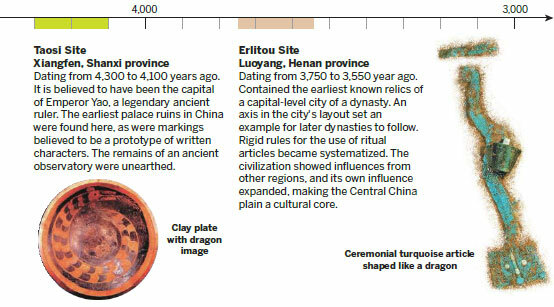 "Erlitou marked the time when the Central China plain began to widely influence the surrounding areas," he said. "It created a foundation for a united country with multiethnic groups." Speaking of how to define "civilization," Zhao Hui, a professor at Peking University who is in charge of the project, said traditional criteria in Western academia, which emphasize the appearance of written characters and metallurgy, have not strictly been used in this project. Liangzhu and several other early civilizations in China, however, are known for their highly developed techniques in making jade articles. "Some characters of human development are common," Zhao said. "The difference also shows there are some unique characters in early Chinese civilization." He said Chinese civilization also absorbed influences from other civilizations. Archaeological discoveries show wheat cultivation, breeding of cattle and sheep, and bronze-making technology in China originated in Western and Central Asia and were later adopted and acquired local characteristics. People in South China were the first to begin growing rice about 10,000 years ago and millet in North China about 8,000 years ago, and thus also benefited the rest of world. "Through the project, we fill a void for a pivotal period in Chinese history," Zhao said. "And it's also a big contribution to the world because Chinese civilization is a crucial segment in human history." The 4,000-year-old Shimao Site, city ruins found in Shenmu, Shaanxi province, had never appeared in any ancient historical record before being unearthed in recent years. The relics show a strong military presence considered to have close connections with Taosi, and they are now treated as one important origin of Chinese civilization. Shen said such new discoveries will be added to high school textbooks. "History education concerns our nurturing of national pride and cultural confidence," he said.